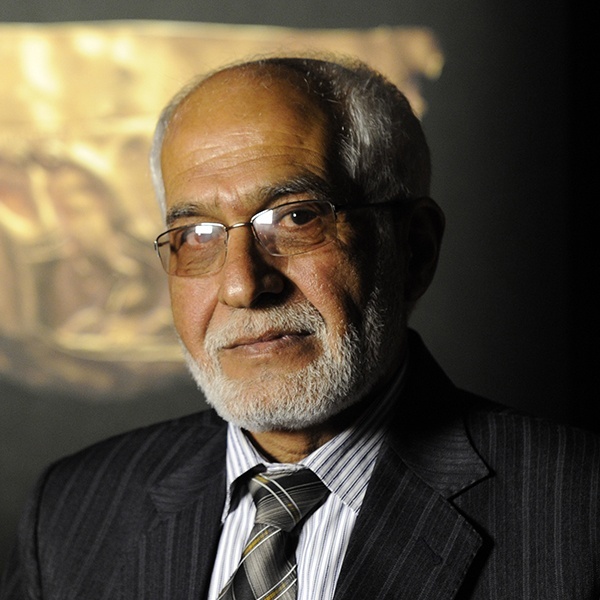 The artefacts in Afghanistan: hidden treasures from the National Museum, Kabul began their journey thousands of years ago, when the country we now know as Afghanistan lay at the crossroads of the ancient world. The four regions that comprised ancient Afghanistan – Bactria, Aria, Arachosia and Paropamisadai – were the sites of complex exchanges of trade and culture. From 3500 BCE, Lapis lazuli from the Sar-i-Sang mines in the north east was sent as far south as Mesopotamia and as far west as North Africa. Later, the great Greek city of Ai Khanoum in ancient Bactria rose and fell on the Oxus River, but not before Hellenism had made its mark on Central Asia. Glass ingots exported from Egypt throughout the ancient world would be refashioned by Roman artisans, to make their way into the storerooms of Bactrian traders. Gold jewellery flowed east and west through the valley passes that crisscrossed the Hindu Kush. As many of the ancient civilisations of Afghanistan have left us no historical traces or written records, these artefacts do more than illustrate tastes and traditions – they document human interaction in one of richest cultural regions in the world. The National Museum of Afghanistan, located in Darulaman, Kabul, is therefore more than just a national archive; it is a monument to a shared human history. In the late 1970s the Museum housed more than 100,000 objects. However, over two decades of civil war and conflict have exacted a terrible toll on its collection. During Soviet occupation of Afghanistan the Museum was commandeered by the military and many of its treasures were hastily removed. Worse was to come. During years of civil war a rocket attack destroyed the Museum’s roof and storerooms, allowing thousands of artefacts to be lost and looted. By the mid 1990s only 4000 objects could be located. Then came the Taliban’s disastrous 2001 edict mandating the destruction of ‘idolatrous’ works; another 2500 were lost. Were it not for the remarkable foresight and bravery of the Museum’s staff to hide the greatest treasures and keep their secret safe, the world might have lost a second Library of Alexandria. What was at stake throughout is captured by nine words now engraved at the museum’s entrance: ‘a nation stays alive when its culture stays alive’. 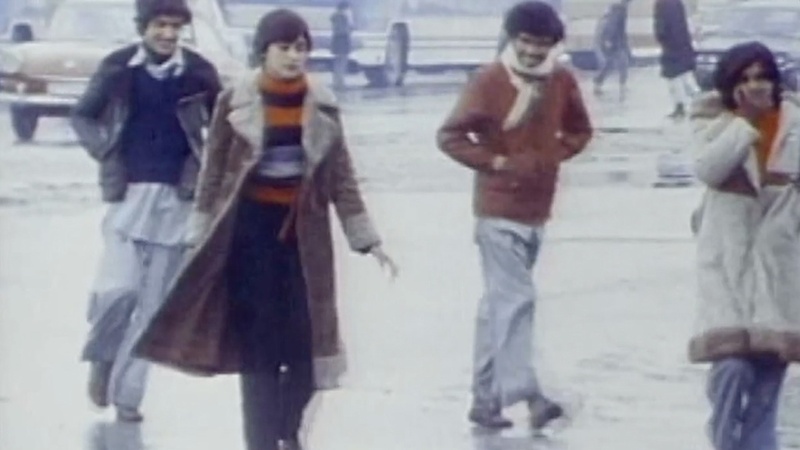 In 1978 Kabul was a city of roughly half a million citizens, a bustling hub of Central Asia. 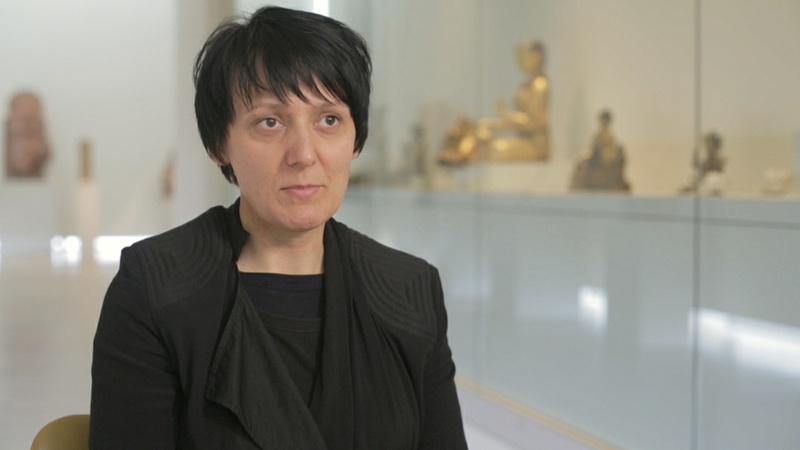 Dr Omara Khan Masoudi, Director of the National Museum of Afghanistan, began working there that year. It was he who wrote the words now immortalised at the Museum’s entrance. In the two decades prior, the nearby Naghlu Dam began supplying the city with hydroelectric power, the Kabul Airport became operational, the country’s first rock music festival was held in 1975, and an organisation named the Revolutionary Association of the Women of Afghanistan was founded. This was also a golden age for archaeology in Afghanistan. In 1966 a new rush to explore the region was provoked by the accidental discovery by farmers at Tepe Fullol of golden bowls bearing Mesopotamian designs. This chance find proved the importance of Afghanistan to ancient trade routes. More exciting finds were being unearthed. Between 1964 and 1978 a French mission discovered the remarkably preserved ruins of the city of Ai Khanoum, a bastion of Greek civilisation in the east. Then in 1978 Russian archaeologist Viktor Sarianidi uncovered one of the world’s great archaeological finds. 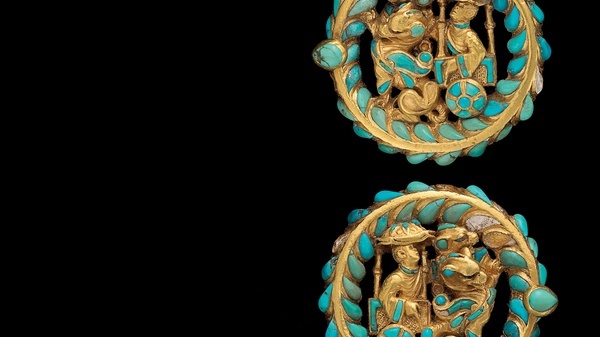 On the slopes of Tillya Tepe in northern Afghanistan, in six burial mounds, he unearthed the Bactrian Hoard: more than 20,000 items of gold and precious metal including the folding crown of a nomadic princess, gold buckles and brooches and thousands of jewelled objects that illustrated the country’s immense cultural wealth. Then in 1978 Russian archaeologist Viktor Sarianidi uncovered one of the world’s great archaeological finds. Yet that same year brought disaster for the Afghan people. 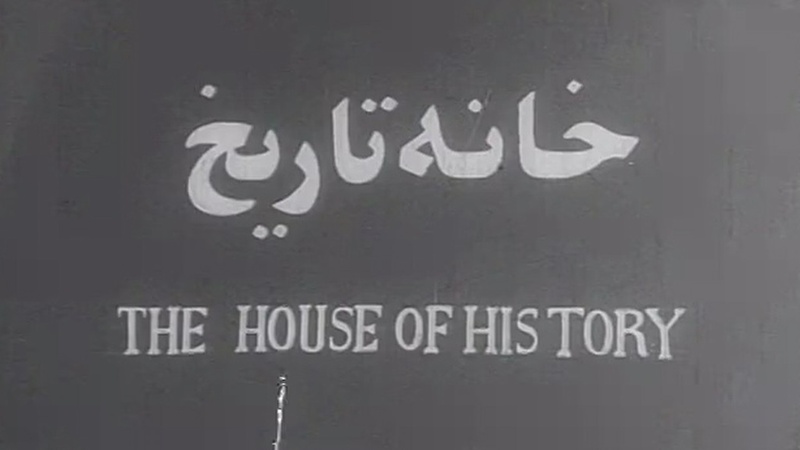 In the early hours of April 28, 1978, troops from the communist People’s Democratic Party of Afghanistan began a coup that resulted in the death of President Mohammad Daoud Khan and most of his family. It would become known as the Saur Revolution, but it was far from a people’s uprising. In December 1979, Soviet troops entered the country to support the communist government and fight the mujahideen, sparking a decade of guerrilla warfare. 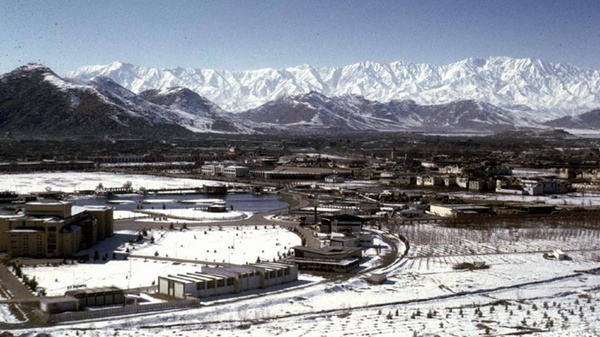 Even before the Soviet invasion Afghanistan’s culture was under assault. Zalmai Haidary was an archaeologist in Kabul at the time. 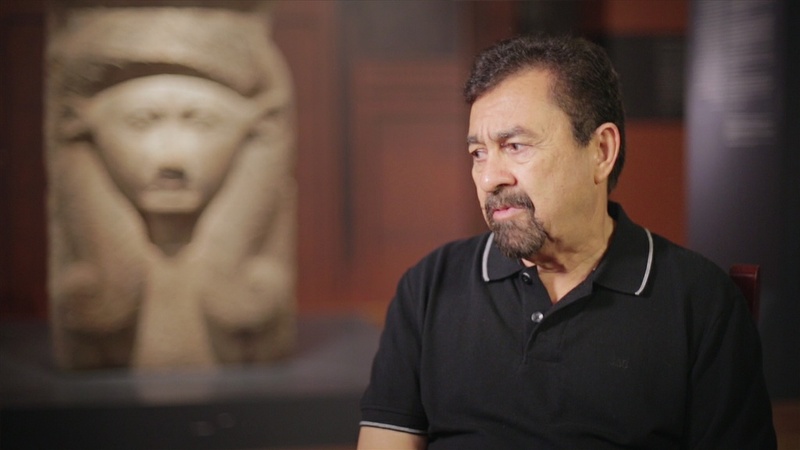 He worked on one of the Museum’s prized objects: the largest known coin in the ancient world. 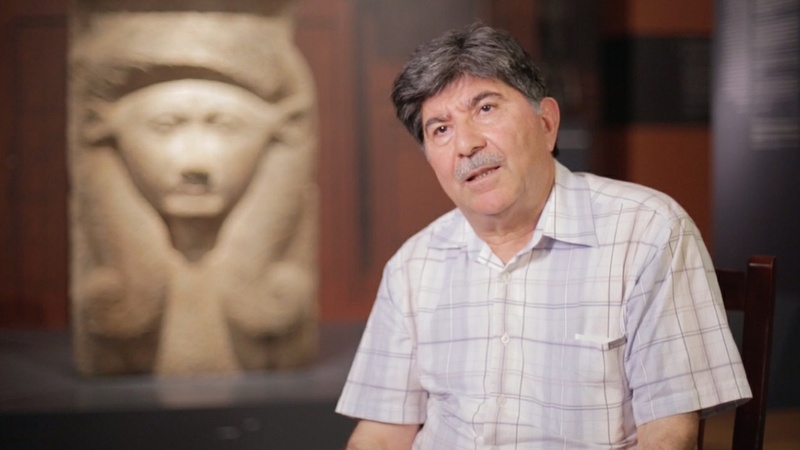 However as Haidary recalls, ‘After the Saur coup occurred, unfortunately there was less value on the artefacts, culture and arts. There was more [emphasis] on the military line. 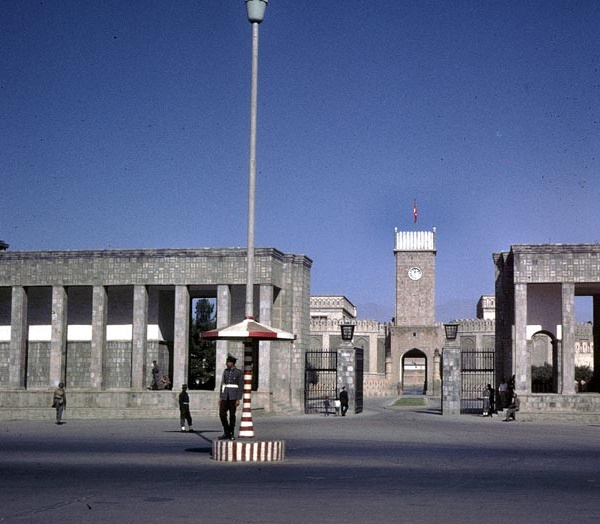 They were trying to push toward a militarised zone [in Kabul].’ True enough, in April 1979 the communist government commandeered the National Museum as a military outpost. At short notice the Museum’s collection was ordered to be removed. Priceless artefacts, including Hellenistic stone and bronze statues, gold bowls, fragile Roman glassware, early Islamic carvings, Buddhist ivory sculptures, Nuristani wood statues and vast numbers of ancient coins were packed into temporary housings. ‘The works of art were removed hastily and handled without care, without regard for the scientific and technical standards that ought to have governed their packaging and transport,’ says Masoudi, who was a part of the operation. Luckily, the objects did not remain in limbo for long. In October 1980 the communist government handed back the building and reinstated the Museum. Haidary was one of about 17 workers charged with re-establishing the Museum. His role included counting and registering the objects, as well as some restoration work with broken objects such as statues and frescos. While for the moment the security of the collection was assured, it was far from a happy homecoming. 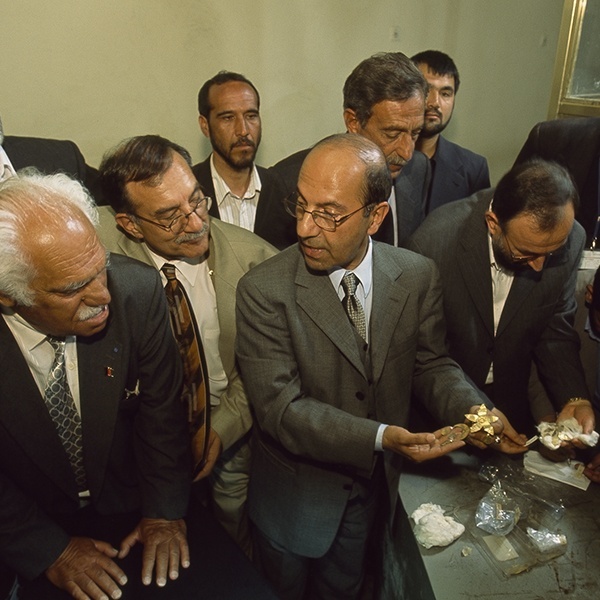 Haidary was part of the first delegation to re-enter the Museum. What he discovered in the basement was horrifying. The Saur Revolution began an era in which the history of Afghanistan was slowly erased. 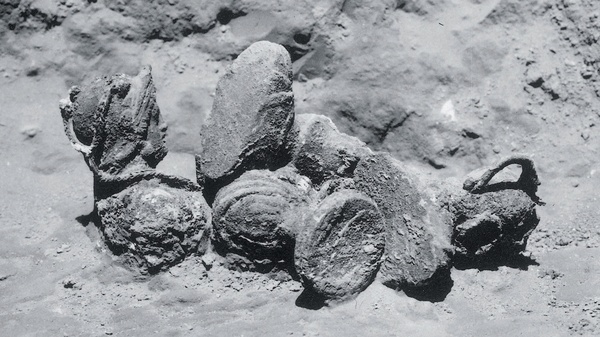 The French excavation of Ai Khanoum was abandoned in 1978. The site became a warzone, pock-marked not only by shellfire but also the digging of looters. Though Viktor Sarianidi excavated six tombs in 1978 at Tillya Tepe, a seventh had to be abandoned; what it held we may never know. 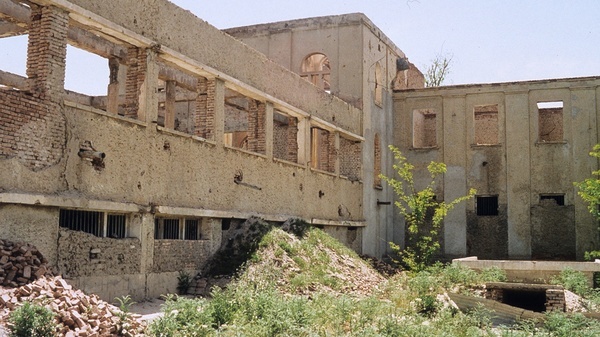 An outdoor museum at Hadda, eight kilometres east of Jalalabad, was looted and burned in 1981. As the ten years of war drew to a close and Soviet troops prepared to leave, the Museum was confronted by an ever-worsening security situation. The staff faced a terrible dilemma: risk packing up and transporting the objects again, or take a chance on the stability of the government. Ultimately, Museum staff, in consultation with the Ministry of Information and Culture, decided to move the collection’s most valuable objects from Darulaman to the city centre for protection. The fall of the communist government in 1992 bled into a civil war between rival groups of mujahideen that lasted four years. ‘The long war years made the lives of Kabul’s population hellish,’ says Masoudi. ‘Industry, all marks of civilisation, state provisions and private assets were plundered or left in ashes. Thousands of Afghan families had to leave the country.’ It also ushered in a disastrous era for the National Museum. Darulaman became a no-man’s land and the Museum again a military base. It changed hands between various mujahideen factions several times. Each time soldiers were pushed out the opportunistic ones would steal whatever they could take with them. In a May 1993 attack, rockets struck the upper levels of the building, setting them alight and causing the roof to collapse. The Museum was to suffer further misfortune. In a May 1993 attack, rockets struck the upper levels of the building, setting them alight and causing the roof to collapse. Amongst the objects destroyed were artefacts, photographs and even the records and inventories of the collection, prompting the BBC to report that ‘Afghanistan may have buried its children, but should not be burying its culture’. In 1995 workers entered the building to survey the damage and install steel doors and a temporary roof. What they found was heartbreaking: the coin collection completely rifled, Nuristani sculptures hacked into pieces for firewood, terracotta pottery senselessly smashed. This hasty repair work had little effect; throughout 1995 more objects were lost. 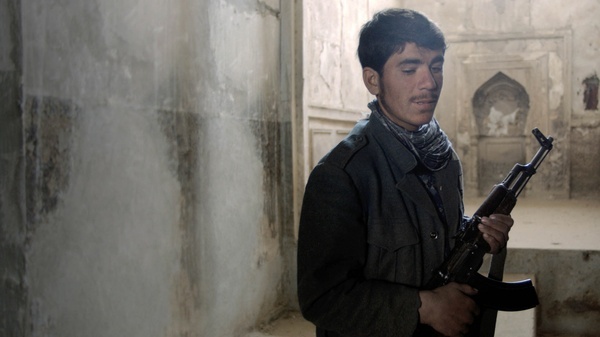 The Taliban rose to power in 1996, bringing a reprieve to the fighting. Surprisingly, they instituted a program to protect the collection. The Ministry of Information and Culture packed the remainder of works from the Museum – about 500 crates – and removed them to the Kabul Hotel, a project that took six months. Then the doors to the Museum were locked for two years; some workers left the country and never returned. In May 1999, a small core of museum workers picked up the inventory that was begun in 1996, which then listed less than 4000 objects – just four percent of the original collection. Luckily, the key treasures of the Museum lay safely hidden underground. In 2000 a secret ministry commission confirmed that the treasures were still hidden. 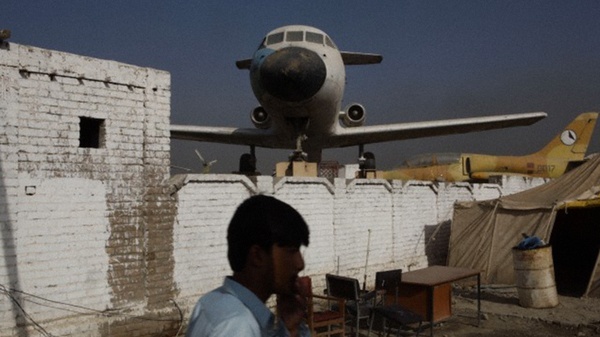 It is unclear whether the Taliban knew about the vault or tried to access it. Here more myths enter the story: some say a lock was deliberately broken and that the Taliban tried but failed to force their way in. Others say the Taliban did not know, or did not care the treasures were there. What is vital is that the crates stayed out of their grasp. 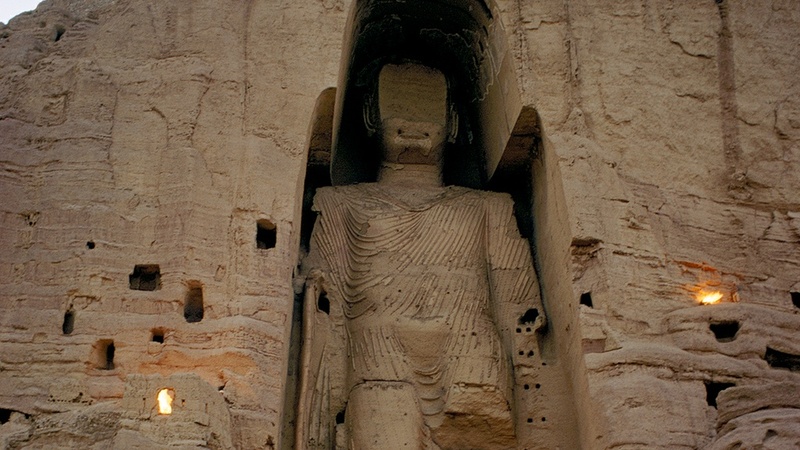 The bombing of the Bamiyan Buddhas foreshadowed another act of violence. On September 11, 2001 two hijacked airliners slammed into the World Trade Centre in Manhattan. The Taliban’s subsequent refusal to surrender Osama bin Laden and key members of Al-Qaeda led to the US-led invasion in October 2001. The fall of the regime made it safer for some residents to return to Kabul and the city’s population soon numbered more than five million. Though the security situation remained fragile, international aid allowed the rebuilding of the Museum and its collection. 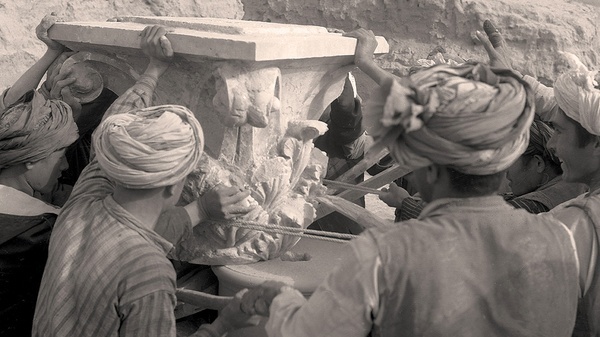 Austrian conservators assisted in restoring smashed Nuristani sculptures and specialists from the Musée Guimet assisted with terracotta and stone objects. Yet after years of war and looting, verification of the treasures was required. Were these the original artefacts, or could they have been replaced by fakes? Key members of the Museum were missing, their whereabouts unknown. In 2004 Viktor Sarianidi was brought from Russia to authenticate the Bactrian Hoard. A locksmith, armed with circular saw and blowtorch, cut open the first of six boxes containing the gold that he had discovered 26 years earlier. They found the treasure intact – Sarianidi recognised an artefact with a small wire repair he had made with his own hands. It took months for a team, which included the National Geographic Society’s Fredrik Hiebert, to inventory the collection, but ultimately every item was accounted for. ‘Every box we opened was like a Christmas package,’ Hiebert said. The rediscovery of the treasure posed new problems of safety and security. 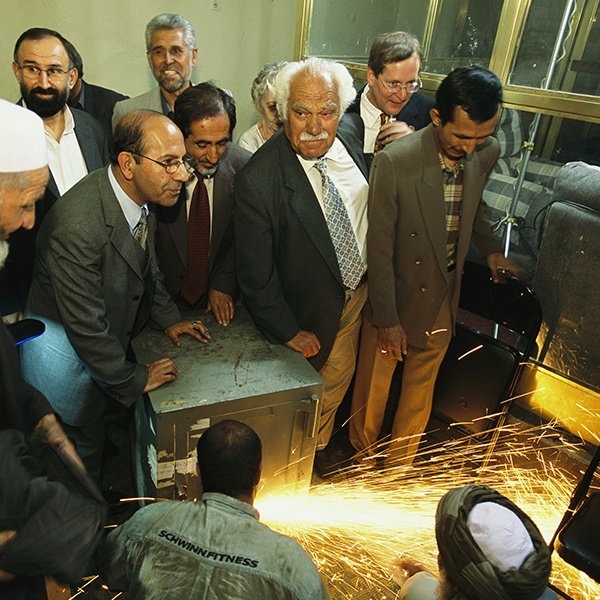 In 2006 the Afghan parliament made the extraordinary decision to send the treasures abroad, first for conservation, then to be toured. With the assistance of the French military the objects were brought to the Musée Guimet in Paris. There, staff began conservation of 324 of the objects. 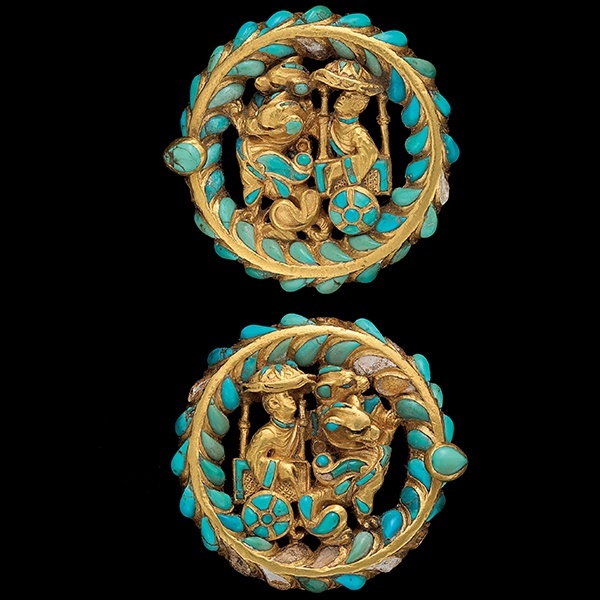 This collection would form the core of Afghanistan: hidden treasures from the National Museum, Kabul, which has been exhibited throughout the world. The tour continues the journey that the objects began thousands of years ago, and in each country the exhibition visits new cultural exchanges are made. 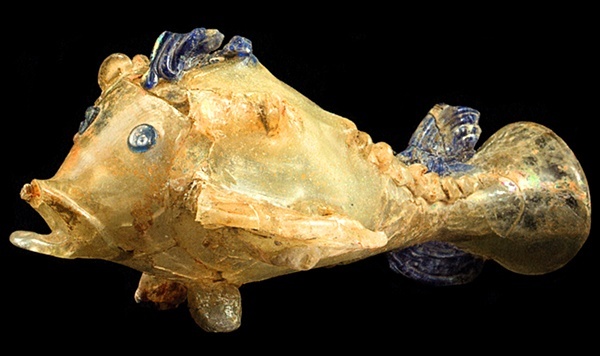 At the British Museum the Kabul staff worked with new scientific tools to bring new meaning to the objects. 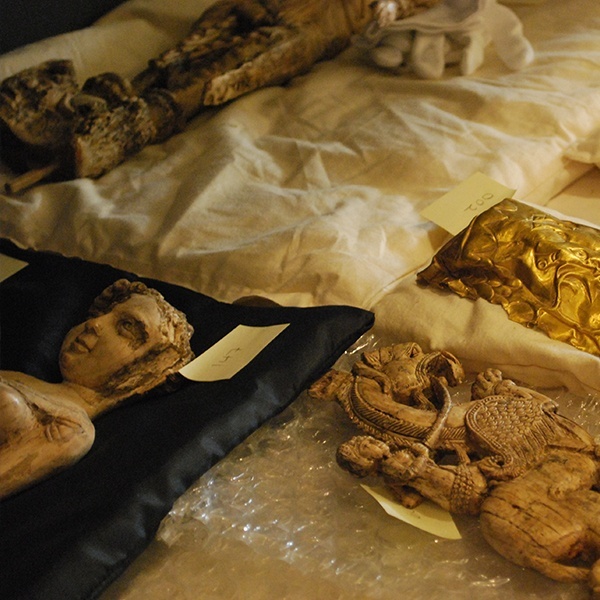 British and Afghan staff collaborated on new ways to combat the black market trade – according to St John Simpson, since 2009 the British Museum has assisted in returning more than 2300 objects to Kabul. Such a model would renew archaeology in Afghanistan and support the development of museum networks. In 2013 an international design competition sought to plan for the National Museum’s future. Yet until the collection’s security can be assured the hidden treasures must remain abroad.